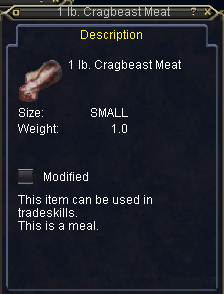 cragbeast are in Natimbi, The Broken shores, I would like to know if this is the foraged cragbeast meat, and if any size can be used or only the one lb? You'll only use the 1 lb meat for the recipes. The larger pieces you forage can be split into 1 lb pieces by putting them in a mixing bowl and hitting combine. A 14 lb. cragbeast meat becomes 14 one pound pieces of cragbeast meat. Where do you find a Cragbeast?